Katie and Mark were married in March at Inglewood Manor in March. Katie chose a wedding flower theme of dusky lilac and ivory flowers which extended throughout her wedding and bridal party flowers. The wedding bouquet is made up of roses, astrantia and wax flowers and give an air of winter and spring. Katie had 2 bridesmaids bouquets, 4 flower girls pomander bouquets & hair circlets and 2 wrist corsages for the mothers of the bride and groom. Her flowers at Inglewood Manor were martini glass arrangements for the aisle, tall candelabra centrepieces for the tables, a long and low arrangement for the top table as well as staircase arrangements and a cake topper. 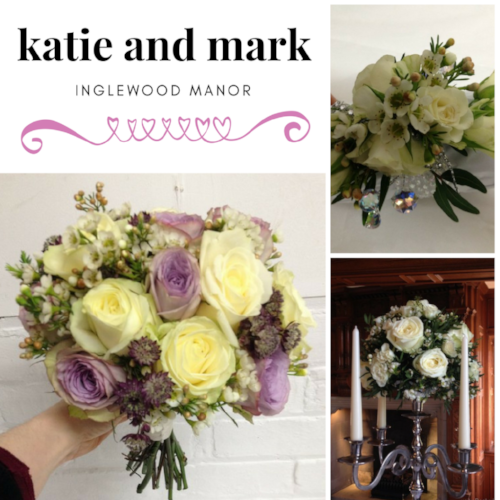 To see all of her beautiful flowers, please go to Katie and Mark's wedding gallery here.